When we deliberately think about something, it is very important to have a precisely defined focus. What should be the outcome of the thinking? If we know what outcome we want, then it is not that difficult anymore to know what thinking steps to do. To get a good focus, it is helpful to ask for ourselves what kind of thinking that should be done, what the context of the thinking is, or what the thinking situation is. 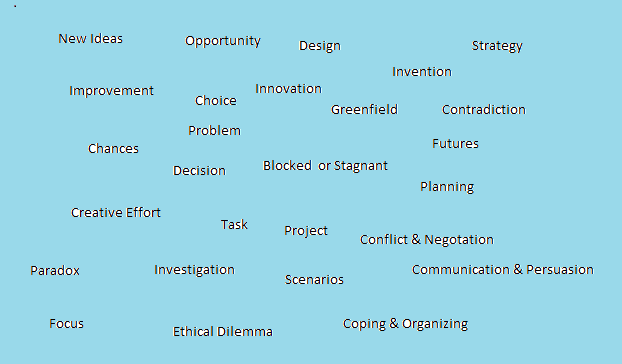 In the image below some 30 thinking situations are shown. For every thinking situation mentioned above exist a well defined thinking road map, either in CoRT, Lateral Thinking, Six Thinking Hats or TRIZ. However, it is far better to design your own thinking road map because it will help you to “get grips upon the thinking task”. Designing your thinking steps is essentially a Blue Hat Thinking task or a metacognitive task. How do you know, who you are?